Salt Spring artist Bruce Rivard is preparing for his final days at Lady Minto Hospital, after being diagnosed with stage 4 pancreatic cancer around six weeks ago. 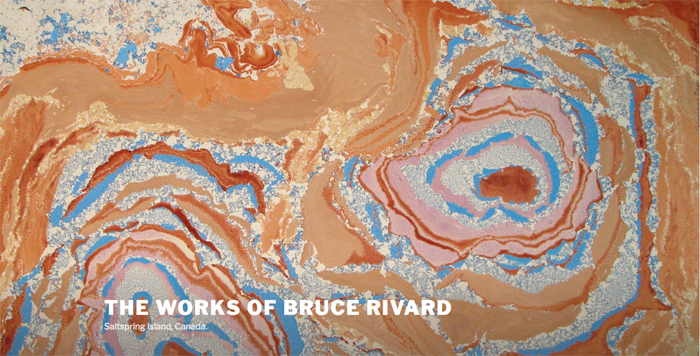 Friends and family members who are dealing with that fact are also organizing one last exhibition of Rivard’s work, with a legacy show and benefit set to open at Salt Spring Gallery on Friday, June 1. Rivard’s daughter Grace “Kyle” Budeweit and his friend and former roommate Tomiko Koyama have been at work sorting through Rivard’s large collection at his home and studio, located just next door to the gallery. They will present around 50 pieces to be shown from June 1 to 3. The show reopens for a final day on Tuesday, June 5 and will be capped with a live auction of any unsold works, to be MCed by Dave Phillips. Sales from the benefit show will help Budeweit, her partner and their infant daughter Quinn, who was born just a few days after Rivard went to the hospital. The family will be responsible for clearing out Rivard’s home and garage along with burial fees, death tax and all the other related expenses. Anything left over will help them with their 10-year plan of buying a small cafe in Courtenay. That’s where they were living before Rivard’s diagnosis came in. Though the reason for returning is not ideal, there are positives to spending these last weeks together. “It’s really nice to come home with his new granddaughter and for him to know I have a really loving partner and his family, who will take care of me in the next phase of my life,” Budeweit said. The show’s closing reception and auction on June 5 runs from 5 to 8 p.m. Donations can also be made to the family at the gallery, or contact kgbudeweit@outlook.com to help directly. For more on this story, see the May 23, 2018 issue of the Gulf Islands Driftwood newspaper, or subscribe online.